Amazon on Wednesday announced the latest addition to its Kindle line of e-readers, the 8th generation Kindle Oasis. The device, which Amazon says is its thinnest and lightest Kindle to date, features the same 6-inch 300 PPI E Ink Carta display found on the Kindle Voyage and latest Kindle Paperwhite. Amazon has added 60 percent more LEDs which the company claims increases the consistency and range of screen brightness. The Oasis also includes 4GB of local storage (with free cloud storage for all Amazon content) and 802.11b/g/n Wi-Fi with support for WEP, WPA and WPA2 encryption. Buyers also have the option to add 3G cellular connectivity at an additional cost. What’s most noteworthy about the Oasis, however, is its radical new design. The device is constructed of a plastic chassis with a special electroplated metal alloy on top which affords a thin yet sturdy chassis. Measuring only 3.4mm at its thinnest and 8.5mm at the hump, the Oasis tips the scales at just 4.6 ounces (131g). The aforementioned hump is perhaps best described as a grip, making it easier to hold during use. The Oasis is also the first Kindle to use an accelerometer meaning both left- and right-handed users are subject to the same ergonomic experience. A device as thin as this isn’t without compromise as a single charge will only last a couple of weeks (versus nearly six weeks with the Voyage). To overcome this, Amazon includes a stylish leather charging cover in your choice of black, merlot (a deep red) or walnut (brown). The book-style cover utilizes a dozen magnets to keep the lid closed while not in use. The cover also features an integrated battery that brings the Oasis’ total runtime up to eight weeks - a fighre that Amazon says is calculated based on a half hour of reading each day with wireless off and the light setting at 10. When the cover is attached, it’ll automatically recharge the Oasis. What’s more, both the Kindle and the cover can be charged simultaneously and there’s even a hibernation mode to further extend runtime when the device is inactive. When connected to a computer via USB cable, the Oasis recharges fully in less than three hours. Given its name, the Oasis ironically enough isn’t waterproof. Oh, and it’s also very expensive. 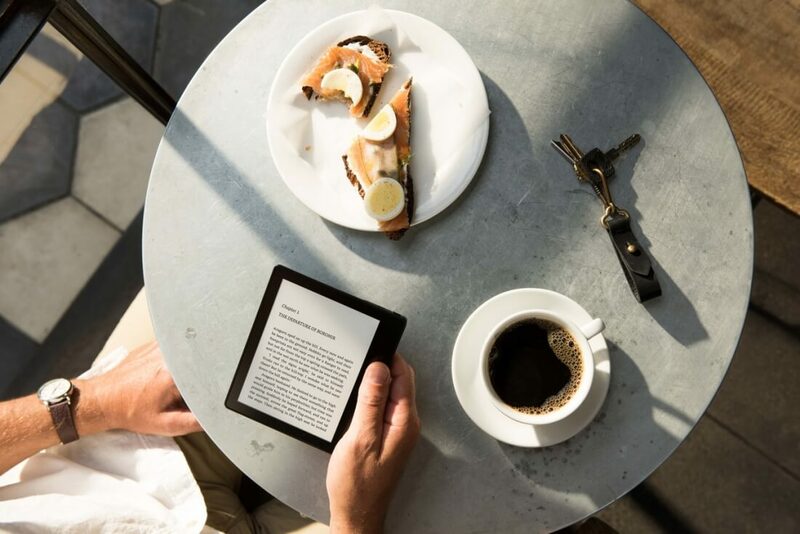 The Amazon Kindle Oasis launches on April 27 and is currently available for pre-order. Pricing starts at $289.99 for a Wi-Fi model with lock screen ads. A full-feature Oasis with Wi-Fi + 3G connectivity, no lock screen ads and a three-year protection plan from SquareTrade (the Oasis comes with a standard 10 year limited warranty) bumps the cost up to a whopping $479.98 (or $379.99 without the extended warranty).